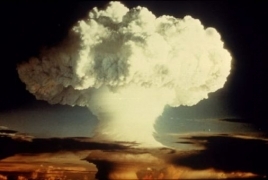 PanARMENIAN.Net - Iran will never develop atomic bombs because the country opposes killing of innocent people, a senior member of the Assembly of Experts told the Islamic Republic News Agency (IRNA) on Tuesday, February 12, IRNA reports. "My remarks in the religious ceremony were the same thing that had repeatedly been said by Iranian authorities," said Ayatollah Ahmad Khatami, referring to his earlier comments that Iran has the ability to develop nukes. "Iran has the formula to make the atomic bomb, but what we are loyal to is the fatwa issued by the Supreme Leader Ayatollah Seyyed Ali Khamenei," Ayatollah Khatami had said on Monday. He added that nuclear energy technology has become indigenous. But that doesn’t mean Iran is after making nuclear weaponry, he said. He also said that making an atomic bomb is clearly against the law of sharia.